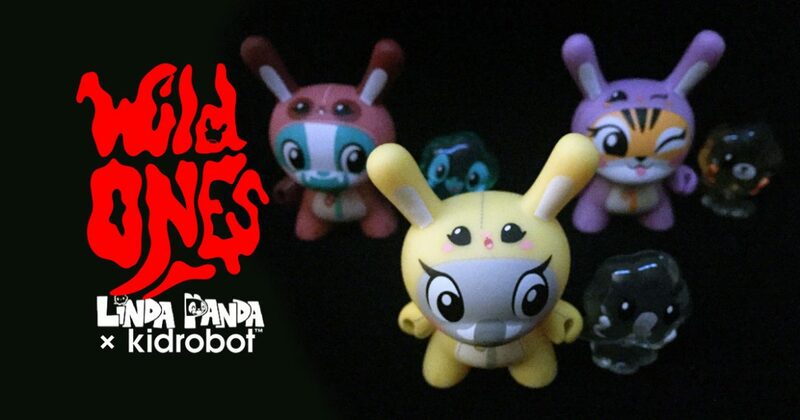 Narrowly escaping from our previous encounter, we venture further into the realm of the Wild Ones, a land inhabited by the creature creations of Kidrobot‘s first Dunny series of 2018. Pausing to catch our breath, we’re startled by a rustling emanating from within a nearby bush. Steadying ourselves for the worst, three adorable animals scamper out, sentient puffs of gas trailing behind each. This can only mean we’ve discovered the Wildly Gassy Trio, three cute critters from the mind of Linda Panda. And who is Linda Panda? Born Linda Hong, this Los Angeles native had her interest in art perked at a young age, a passion that eventually led her to the Otis College of Art and Design. Graduating with a Toy Design degree in 2007, Hong was quickly employed by MGA Entertainment to design products for their then-recently acquired Little Tikes preschool brand. Fifteen months later, she embarked on an almost seven-year-long career at Spin Master, serving as lead designer on various toylines, including Popples and Zoobles! Then, in April of 2015, with her wedding only six months away, Hong decided to strike out on her own, becoming a freelance designer under the name Linda Panda. But this wasn’t the first time she’d used the name, as it had been the alias she’d employed since around 2010 for her own world of characters. Showing an affinity for cute animals expelling adorable fart clouds, her illustrations have adorned prints, apparel, and other merchandise. And having previously worked with Kidrobot in 2017 on collectible vinyl figures, specifically the Crayola co-branded Coloring Critters Series and the Care Bear-based Polite and Perfect Panda pieces, Linda Panda took the opportunity when invited into the company’s Wild Ones series to truly show off her artistic perspective. Depicting three animals that could’ve stepped straight out of the pages of a children’s book, the artist refers to these Dunny designs as “The Wildly Gassy Trio”. And a more appropriate collective name for them couldn’t be had, as each one is accompanied by a translucent cloud capable of seemingly billowing from her creations’ posteriors. In a smart move to explain the rabbit-like ears of these factory-made forms, Linda Panda’s pieces are decorated in zippered pajamas, bunny faces adorning the topmost edge of their hoods. With drop-bottom flaps slightly ajar, revealing the animal underneath’s tail area, the variations between each of the three designs make them feel wholly their own regardless of the shared concept between them. Continue on to Post 5 of 9 in the series “Wild Ones Dunny Series”. Click Here to Acquire the Wild Ones Dunny Series from Kidrobot, or Click Here to Find a Kidrobot Retailer to Order it from.